Our driver will receive you from the Guwahati Airport/ Railway Station. From the Airport/Railway station our driver will take you to Pobitora Wildlife Santuary where you will stay in a Wildlife Resort. The drive from Guwahati to Pobitora is 1 hour. You will start the next morning with an Elephant Ride in Pobitora. 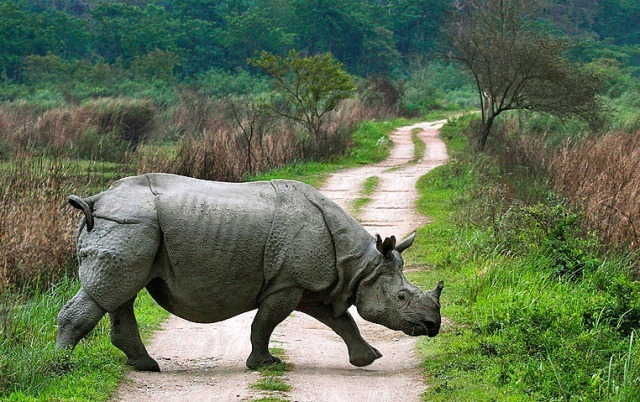 After the ride you will leave for Kaziranga National Park (3 hours), home to the one horned Rhinoceros. It holds a record population of more than 80% of the one horned Rhinos in the world. Kaziranga also has the highest density of tiger population in any protected area in the world. Upon arrival at Kaziranga, we check into a wildlife resort. In the evening we visit the cultural centre for various cultural events. Overnight stay at the wildlife resort. Today, we go for a morning Jeep Safari in the Kohora range. Kohora Range is famous for varous endangered animals like One Horned Rhinocerous, Wild Buffalo, Royal Bengal Tigers, etc. In the afternoon, we take you to another range, Agoratoli Range, which is famous for Bird Watching. Your stay will be in the same resort in Kaziranga. After Breakfast, we leave for Nameri National Park which is 3 hours from Kaziranga. Nameri is famous for its elephants and other animals including tigers, leopards, gaurs, wild pigs, sambars, etc and also for being a bird watchers paradise. You stay in Nameri National Park will be in Nameri Eco Lodge. In the afternoon, we go for rafting in the Jai Bharali River. The rafting route is 13 km long and takes about 3 hours. A great, tiring and enjoyable experience. Stay overnight. After Breakfast, we leave for Guwahati Airport/ Railway Station.